China's ride-hailing giant Didi Chuxing is set to launch in Melbourne, Australia, from 25 June as it continues its international expansion. The firm, which recently launched in Mexico, has just completed a month-long trial in close-by Geelong, Victoria. Didi is the world's largest ride-hailing app and is best known for driving Uber off the streets in China. Valued at about $56bn (£39.4bn), the Chinese giant is also the world's most valuable start-up. The Australian ride-hailing industry is currently dominated by Uber, but recent entrants to the marketplace include India's Ola and Europe's Taxify. Australian firm GoCatch is also a player in the market. Didi says the service it will offer in Melbourne will be its core ride-sharing arm, Didi Express. It started recruiting for drivers in June but would not share exactly how many it hoped to put on Melbourne's roads. "What I can say is that Melbourne drivers are continuing to respond exceptionally well to the product we are offering... in fact, nearly 100 drivers attended a driver registration day on Wednesday," a Didi spokesperson in Australia told the BBC. The firm's app can be downloaded in Australia from Friday 15 June, and riders will be able to receive 50% off their trip from 25 June until the end of July, the firm said. But the discounts will be capped at a maximum of 10 Australian dollars ($7.45; £5.65) per trip, with a maximum of two trips a day. 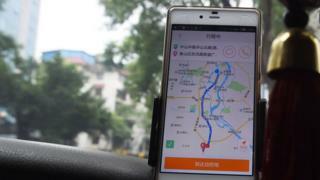 Didi claims to have some 550 million users across its app-based transport services, which include premier taxis, express cars and food delivery.